Earlier this week I was in the land of ABBA, IKEA and H&M. Sweden is one of my favourite countries in the world, and I am a big fan of Scandinavian fashion – from high street to high-end. Besides, I am partial to the idea of a ‘smorgasbord’ — another Swedish invention — in my own wardrobe: a variety of colours, styles, origins and price points. To start with, let’s talk about H&M, one of the best-known Swedish brands internationally. Since the launch of its Conscious Collection in 2013, H&M has firmly positioned itself as one of the most sustainable high street brands. For instance, H&M is the number one user of certified organic cotton in the world, and aims to achieve 100% sustainable cotton sourcing by 2020. It also uses hemp, recycled polyester and recycled wool. Olivia Wilde is the face of H&M’s 2015 Conscious Exclusive collection. Photo via H&M. The face of H&M’s 2015 Conscious Exclusive collection is American actress Olivia Wilde known for her down-to-earthness and sustainable values. She is the cofounder of philanthropic e–commerce site Conscious Commerce. “Sustainability has got a bad reputation, especially in fashion. I think people assume the clothes will be dull, the fabrics uncomfortable and the design uninspiring. It’s like people think sustainability is a penance. This couldn’t be further from the truth, and the H&M Conscious Exclusive collection shows that sustainability is no compromise on style,” Wilde told WWD. Hear, hear! Filippa K is a Swedish brand built on a vision of sustainability. Photo via Filippa K.
Another great Swedish brand with sustainability at the heart of its DNA is Filippa K. The brand’s vision for over 20 years has been “Fashion where sustainability is the guide to growth”. Filippa K is known for its effortless, essential garments with clean design and high quality. And it is also committed to doing business in full respect of the planet’s ecological boundaries. To quote Filippa Knutsson, founder of Filippa K: “Inspired by my own needs, I set out to build a brand that had substance and truth, not dependent on the superficial trends of the fashion industry.” That’s what I call slow fashion at its finest. Last but not least, Swedish Hasbeens is a 1970s inspired retro footwear brand that counts Kylie Minogue, Sienna Miller and Sarah Jessica Parker among its fans. Swedish Hasbeens not only makes clogs, but also boots, belts and bags from vegetable tanned leather and natural wood. All products are handmade in the same small Swedish factory. 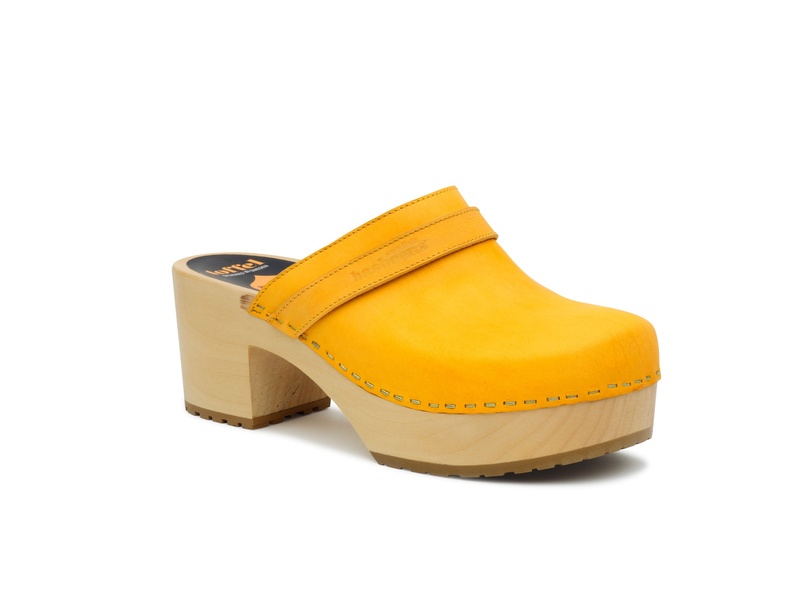 This pair of canary yellow clogs will certainly help you channel your inner Pippi Longstocking! Swedish Hasbeens shoes are handmade from sustainably sourced natural materials. Photo via Swedish Hasbeens. That’s it from me today. Hejdo! Thanks Rohma! Would love to visit your city one day – and thanks for introducing me to Monki! Yes! I am revising my blog to include more Eco fashion to show that it can be stylish. One conversation I had with classmates about the topic and they all thought it meant the fabric was edible or would disintegrate when washed. Really?! There needs to be a bigger push for fashion and style bloggers to bring Eco to the forefront. And that’s what I intend to do. Hello Sakeenah! Thanks for your message and your interest in eco-fashion! Biodegradable means in fact that something dissolves in the landfill unlike polyester, but it would not be safe to eat nonetheless!